Shepard went dark on New Year’s Eve, but a warm, family-friendly hangout will soon open in its place. 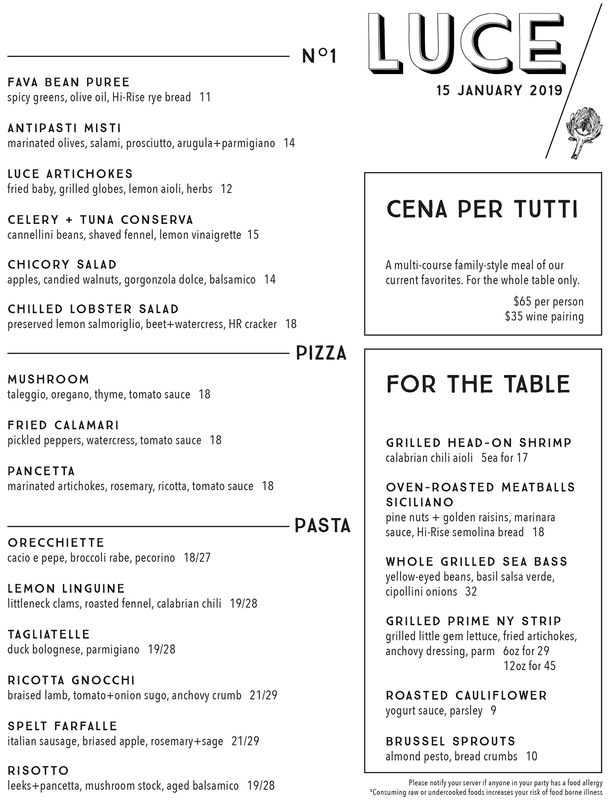 Luce is on track to open on Tuesday, Jan. 15, with a menu of house-made pastas, pizza, and more seasonally-driven fare. Check out the opening menu below. Luce (pronounced like “loose”) is the second act in the space from owner Rene Becker, and it’s named after his 7-year-old daughter, Lucy. Becker opened Shepard in 2015 in partnership with chef Susan Regis, but after the city of Cambridge put the kibosh on the restaurant’s live-fire cookery, the business partners split amicably. 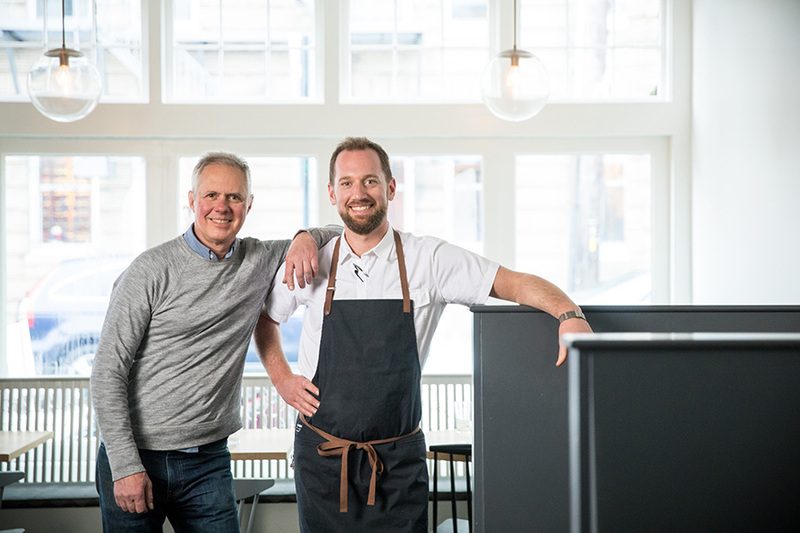 Becker eventually hired chef Scott Jones, who has been integral in developing the new restaurant. Beverage director Nic Mansur, who earned a Best of Boston award for Shepard’s cocktail program, remains behind the bar at Luce, and Ben Weisberger, who joined the Shepard crew this past June, is the new restaurant’s general manager. “Since September, we really started moving in the direction that we wanted to go, which is basically Italian,” Becker says. He has traveled in Italy extensively and has always loved the cuisine. The restaurateur previously owned the shuttered Cambridge shop, Real Pizza; and Jones was culinary director of Barbara Lynch’s restaurants, including Italian-influenced Sportello and Menton. That’s how it will be at Luce. The menu opens with a selection of seasonal starters, beginning this month with a chicory salad with apples and gorgonzola dulce; and fried-and-grilled artichokes with lemon aioli. Handmade pasta dishes and grilled, shareable proteins will also change regularly depending on what’s fresh. Luce will make use of a gas-powered, Italian brick pizza oven that Regis installed when Shepard was new. Expect a few choices of medium-thick-crusted pies, topped with things like mushroom and taleggio; and fried calamari, pickled peppers, and watercress. A stellar Champagne program, which was also a Shepard signature, is returning, and so is the option to order half-bottles of other wines. Mansur’s cocktails still focus on clean renditions of the classics, but with more Italian influence now, such as the Negroni Luce, with Hayman’s London Dry Gin, Cappelletti Apertivo, and dry and sweet vermouths. There is a strong selection of amari, digestivi, and grappas; and for dessert, sorbetti, gelati, and espresso. The team has been busy painting and prettying up the restaurant for the past two weeks, and Becker promises the dining room will be “warmer, cozier, a little more colorful” when Luce debuts next week. It will be open for dinner Tuesday-Saturday from 5:30-10 p.m., and it’s already accepting reservations. 1 Shepard St. Cambridge, 617 714 5295, lucecambridge.com.